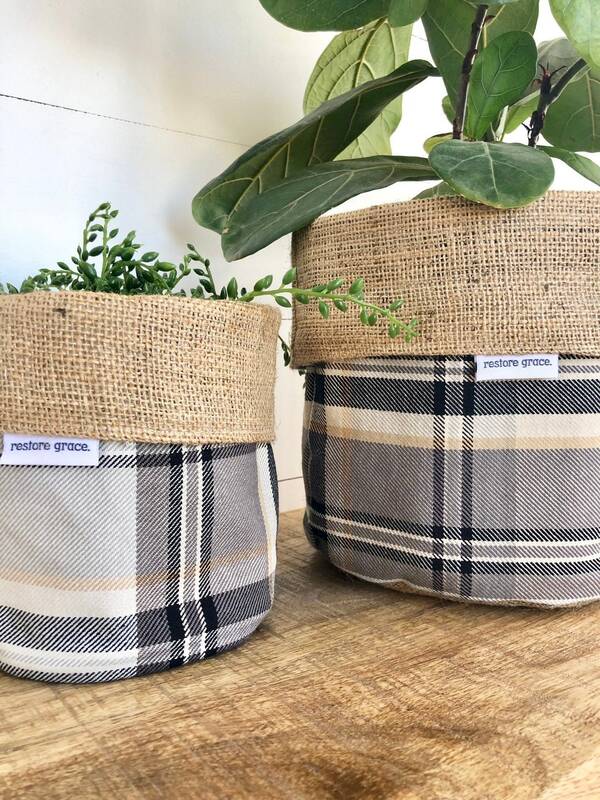 Our reversible hessian planter bags are designed to adorn you ordinary plastic planter pots and add some finer detail to your home! 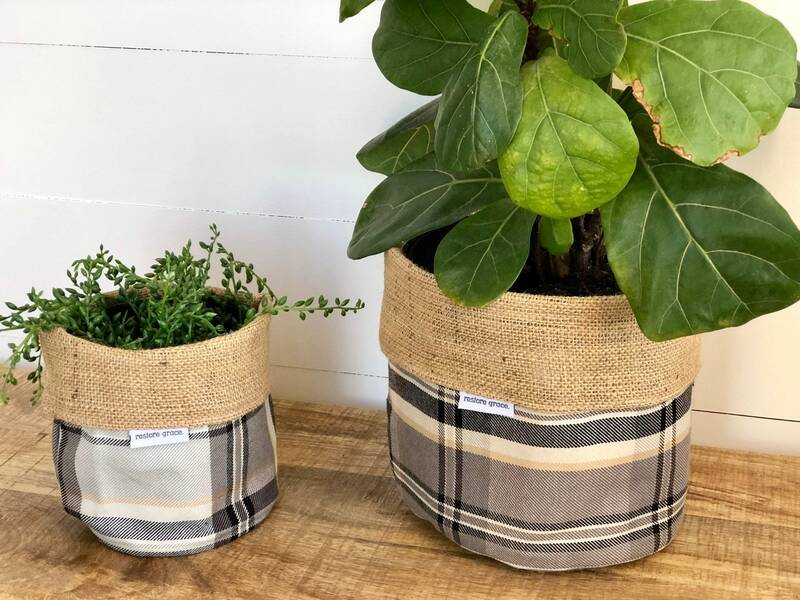 These reversible hessian planter bags are made to fit straight over any standard 140mm (small) or 200mm (large) plastic planter pots. They are designed to cover your plastic pots and are not designed for your indoor plants to be planted directly inside the bag. 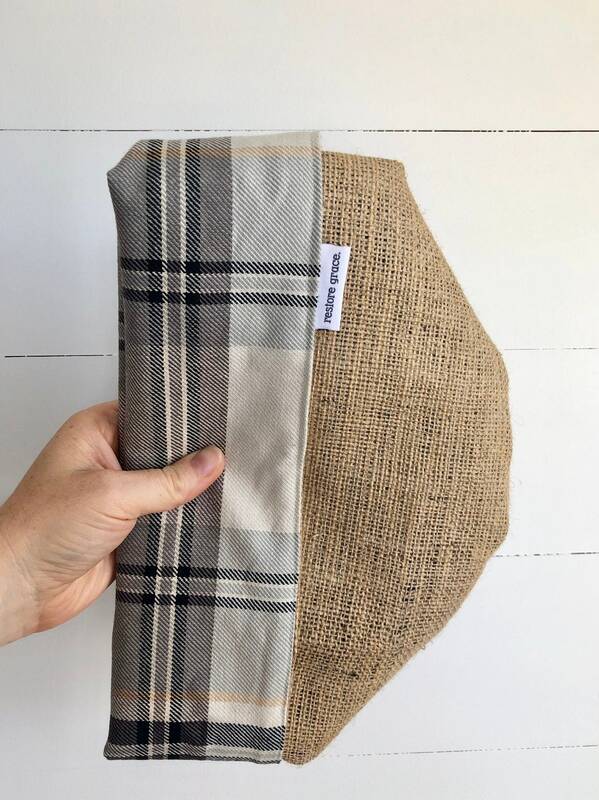 All of the planter bags are reversible so you can change the to fabric pattern or the hessian look as you please! A must have for the style savvy home! Wondering how to water? If over watering your plants is a concern for you, simply place a plate or saucer inside you planter bag underneath your plastic pot. This will catch any water overflow from the plant and also hide the plate or saucer. Please note this is not a necessary step. Custom orders take approximatley 2-3 weeks for completion and payment must be made upfront. Yes, restore grace offer wholesale prices to Australian ABN holders! Email us at restoregrace [!at] outlook.com to receive our wholesale info package! Please upload and tag us in any pics of your gorgeous purchases! All orders will be shipped within 1-2 business days of payment confirmation. All domestic orders will be shipped with Australia Post via regular mail. Domestic regular mail takes approximately 4 to 6 working days to arrive. restore grace offer an Express Shipping upgrade at checkout for an additional cost. Please note we are shipping from a rural area therefore we do not guarantee next day delivery. When processing your order through the checkout Etsy will provide you with an approximate order arrival estimate. All orders will be shipped within 1-2 business days of payment confirmation. When selecting Standard Shipping at checkout this Shipping method is via ECONOMY AIR. This is NOT registered and is NOT trackable mail. You will not receive a tracking number and will not be able to trace your order. Economy air takes approximately 8 to 15 working days to arrive. Therefore by purchasing from restore grace you are accepting these shipping terms and conditions and understand that restore grace cannot be held responsible for any customs or transit delays, loss or damage caused in transit and your orders will not be compensated. Restore grace offers two alternate shipping upgrade to tracked or insured shipping (recommended). PLEASE NOTE: Only insured parcels will be compensated for damaged or lost mail. restore grace are located in Cooma, NSW, Australia. We offer a local pick up or delivery service to 2630. If you wish to void shipping costs at checkout & organise local pick up or delivery please contact us to send you our local VIP coupon code to apply online. We do not accept returns or issue refunds so please choose your item carefully. INTERNATIONAL BUYERS: Please be aware that you will be responsible for any taxes, VAT, customs duties, handling/brokering fees or other amounts that may be levied by your home country for importing. Check with your Customs Office and/or Postal Service if you are concerned about possible tariffs. Yes, restore grace offer gift wrapping for an additional cost. Simply select this option at checkout. When you select gift wrapping you will be able to view an image of how we gift wrap for you. Where are your measurements? Do you have sizing guides? All sizing details and measurements are written in the description of each item. We also have sizing guide illustrations with the images on each product. Yes, restore grace offer wholesale prices to Australian ABN holders. If you would like to work with us and stock our products, please send us a conversation via etsy or alternatively email us at restoregrace@outlook.com and tell us a little bit about you and your business including business name, products you sell, and you website and social media handles (If applicable). Please let us know which product/s you are interested in and we can answer any further questions. We will then send you a copy of our wholesale price list including our terms and conditions in PDF format and can provide you with a quote for shipping costs. 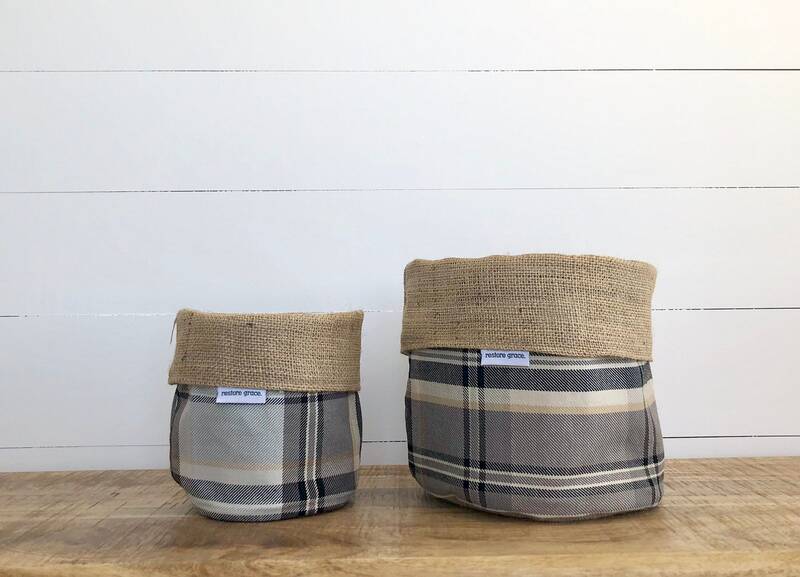 Do you offer custom sizes on your cushions & Hessian planter bags? Yes we do! We can make custom sizes for sizes that we don’t have available online. Please contact us for for a personalised quote. Please note custom orders on current stock are dependant on fabric availability. Custom orders completion times are approximately 2-3 weeks excluding shipping times. If you are after a fabric print or style that we do not currently have in stock we are able to source fabrics for you and send you digital samples. 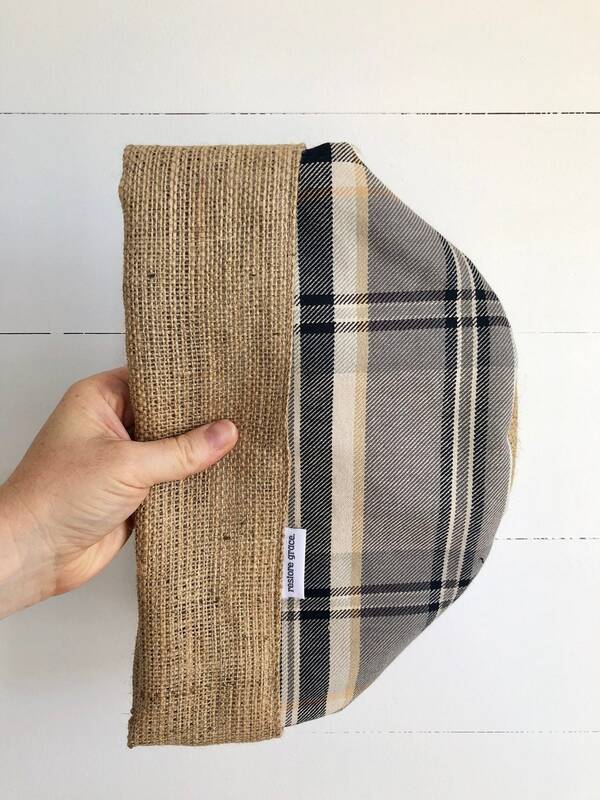 Do you make custom products that you don’t list online? restore grace do not offer custom made orders for any products we do not currently stock. This includes bench seat covers. 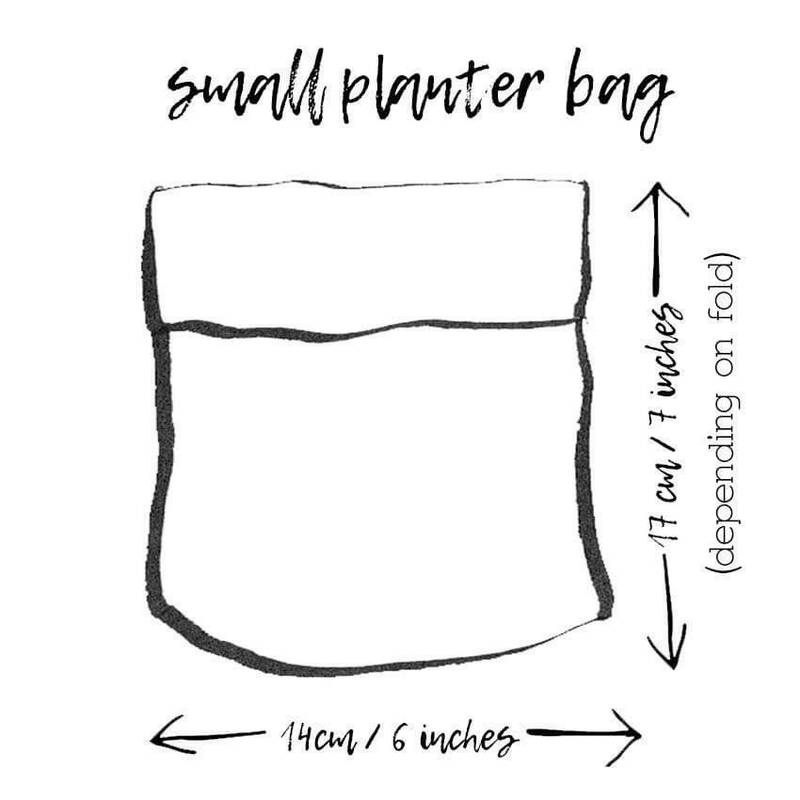 How can I water my plant inside my planter bag? 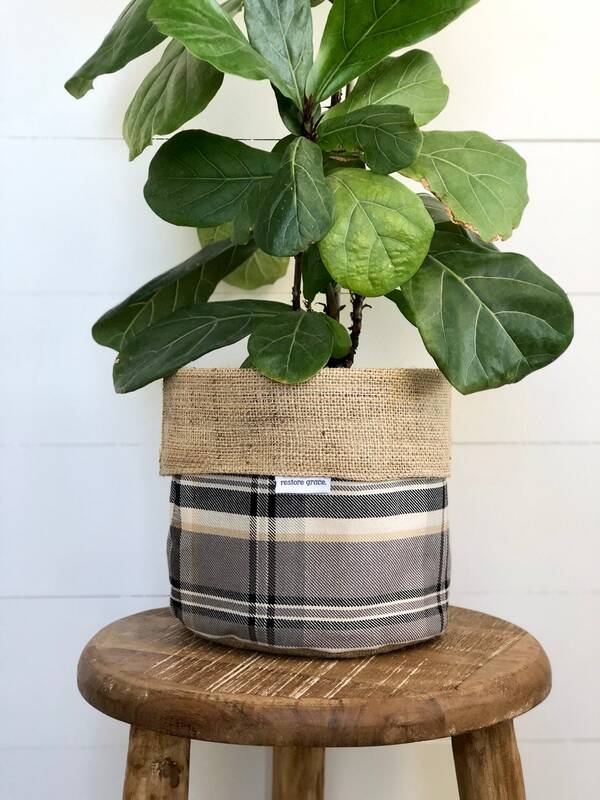 If over watering your indoor potted plants is a concern for you, simply place a plate or saucer inside you planter bag underneath your plastic pot. This will catch any water overflow from the plant and also hide the plate or saucer. Please note this is not a necessary step. 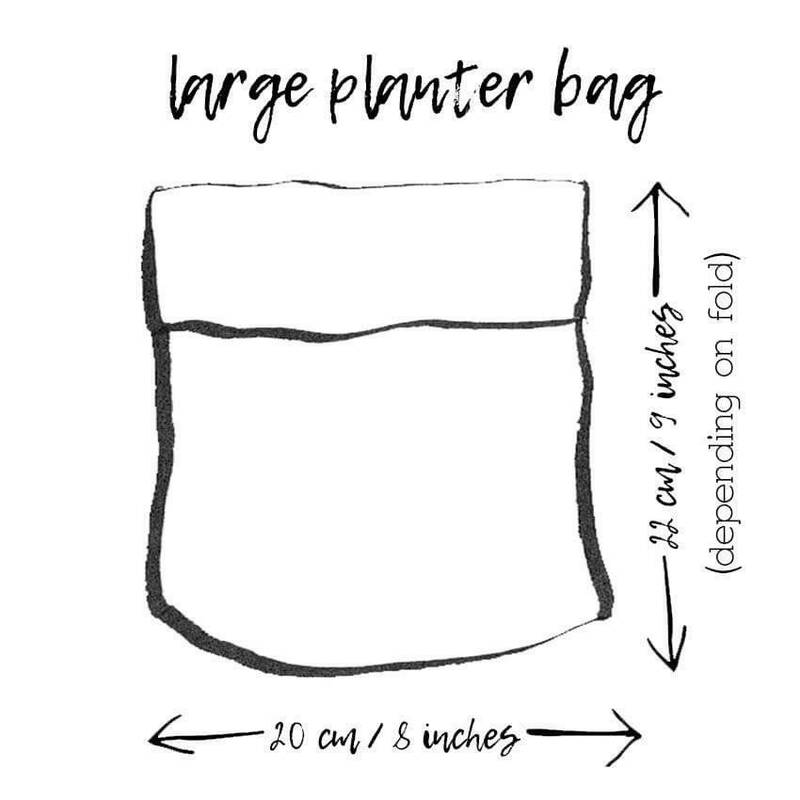 What are the measurements of your Reversible Hessian planter bags? 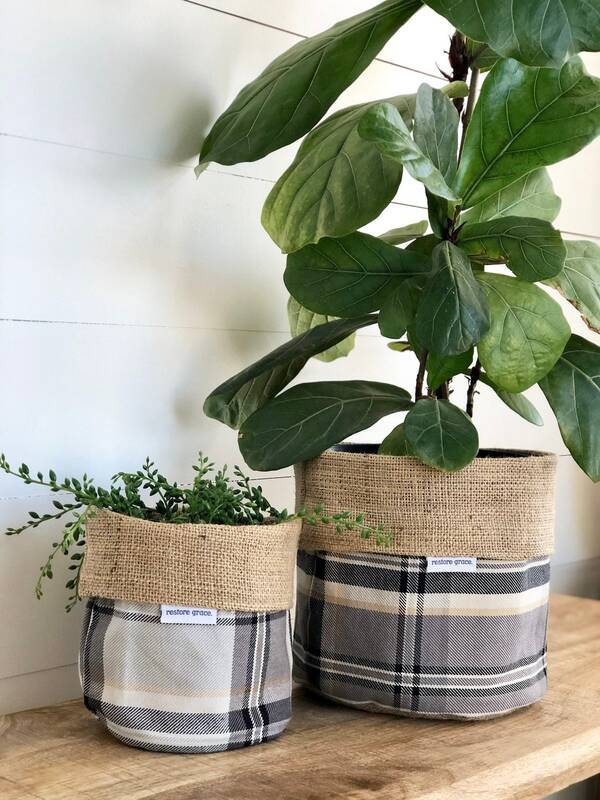 Our hessian planter bags are made to fit straight over any standard 140mm (small), 200mm (large) or 300mm (x-large) size plastic planter pots. These pots are sold as a standard size from bunnings or any nursery. I am an international buyer and I can’t see a tracking number on my order? All International orders are sent via economy air. This is not registered and is NOT a trackable mail service. restore grace offer two alternate shipping upgrades, tracking or insured (recommended) which provide a tracking service. I live locally in Cooma 2630 and surrounds, can I pick up & void shipping costs? Absolutley! If you live in Cooma 2630 or surrounds and you wish to make a purchase, simply contact us! We have a VIP code for locals that will void shipping costs at checkout. We will then contact you to arrange pick up or delivery! I am an International buyer. If i select Standard Shipping at checkout, does this provide my order with a tracking number? No. Standard International Shipping is not a trackable service. When selecting Standard Shipping at checkout this Shipping method is via ECONOMY AIR. This is NOT registered and is NOT trackable mail. You will not receive a tracking number and will not be able to trace your order.